Overall, the standard integration with LightSpeed is easy and there are not a lot of issues concerning this integration. Most common issues with LightSpeed are the following. Questions are mentioned with Q, all possible answers are mentioned with A, A1, A2, etc. 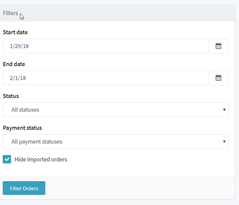 Q: My orders do not appear in my ‘incoming orders’ overview in SendCloud? A1: Check the date-filter and shipment status filter. Some orders have a different status in their LightSpeed shop (could be incomplete or unpaid orders) or are placed on a date earlier in the future. Our date-filter in SendCloud automatically shows the orders from last 3 days when the user is logged in. Also double check if the customer did not try to ‘hide imported orders’. A2: Delete your integration via Settings > Connected shops and delete the SendCloud app from the LightSpeed app store. Reinstall the app and refresh your panel. A: Always first check the Failed Request Logs in your SendCloud account. When there are no failed request logs available, make a print screen from your LightSpeed shop and the orders that are missing. Let us know if your webshop is completely live, if not please set this environment to a live setting and re-connect. When this error is still appearing send this screenshot of your missing orders to contact@sendcloud.sc for further investigation by our Customer Service and Development Team.